> McAfee > Don’t bolt on your data center security after the fact. Build it in for comprehensive protection. 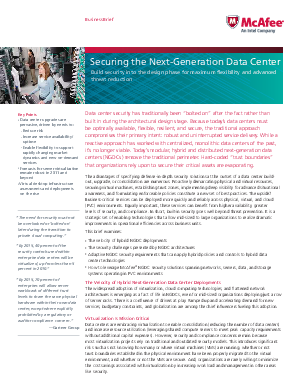 By building in comprehensive security measures at the design and architectural phase of NGDC buildouts, organizations can preemptively optimize business-critical service availability by minimizing potential downtime through greater resiliency. Forward-thinking enterprises that take this route are in a much better position to deploy new on-demand business services more quickly and safely while maintaining efficiencies.